There simply is no substitute for experience. There is a lot more to performing a professional air duct cleaning than most people know. Prairie Dust Busters has been cleaning commercial and residential air duct systems for over 24 years. Our technicians have over twenty years experience working with us and through those years we have learned how to successfully clean the heating and air conditioning systems in any size or configuration of building. It takes many years to gain the knowledge to perfect the air duct cleaning process. Most of our competitors are cleaning systems the way we did years ago! We use the same trucks on large commercial builds that we do on homes. We adjust the suction pressure by adjusting the engine speed. This enables us to dial in the optimum suction power on each and every project. Our Trucks are so powerful that we can run hundreds of feet of 10 inch diameter vacuum hose from our truck to the HVAC equipment we are cleaning. We run hoses up the sides of buildings and clean multiple story buildings. Why is all that suction power important to you? Because the stronger the suction power the neater the job and the results are more complete. Prairie Dust Busters suction power enables us to pull dirt out of air ducts that other systems just don’t have the power to do. 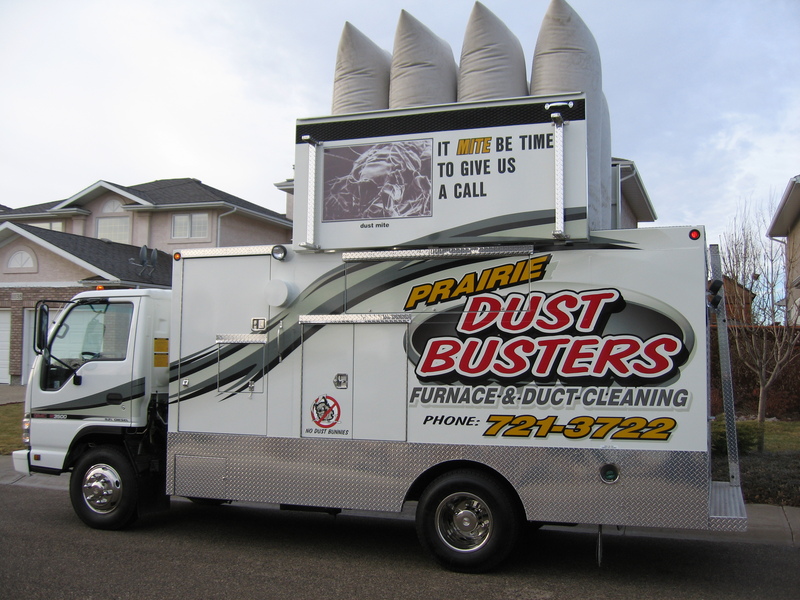 Prairie Dust Busters Truck power also increases productivity and gives us the ability to clean large sections of air duct much quicker than other companies which helps us to keep our prices down and saves our customers valuable time. Our technicians undergo extensive training. Many of our competitors train their employees for short period of time days or weeks and then send them out to clean air ducts in homes and buildings. At Prairie Dust Busters, our employees work as an apprentice assisting one of our technicians for an average of 3 years. We make sure that our technicians understand every facet of our service before we ever send them to your home or building. Other companies only train their technicians using a very limited process that falls well short of our thorough training . Some of our cleaning technicians have over 25 years of experience with our company. It has always been our belief at Prairie Dust Busters, that in order to thoroughly clean an HVAC system you need to fully disassemble a system, and that takes skills that a typical air duct cleaning technician doesn’t have. Our technicians are trained on furnaces and air conditioners, how they function, and how to insure they are running safely. Prairie Dust Busters technicians access every evaporator coil on every system. These coils become clogged and fouled in every system unless they are cleaned regulary. These fouled coils, restrict air flow, contaminate the indoor air and make you sick. Did you know that (1/16 of a inch of dirt on a coil can reduce the efficiency by 21%) The way to clean them properly is to air wash them and in extreme cases we need to wash the coil Prairie Dust Busters has developed a way to wash and clean them in place! We treat everyones home and building with respect we put in the effort and care to lay down drop cloths(left above), We use corner guards(right above) we will cover up important items, move around your house carefully and take every precaution we can to make sure we don't damage anything. When you hire Prairie Dust Busters to clean your heating and cooling system, "we clean the entire system". We inspect and develop a plan for maximizing the effectiveness of cleaning the system while at the same time minimizing the impact to the home and occupants. We access all inspection panels, if there are none our highly trained technicians will make their own access openings for proper cleaning, we will supply access panels at a small cost to you. We clean the entire furnace along with the blower fan, heat exchanger, burners, "all coils", etc. The furnace fan is then reinstalled and all acess openings are sealed with duct caps the access panels are sealed by using duct screws and foil tape insuring no leaks, the entire HVAC system will go through a thorough inspection ensuring proper operation. We put a sticker showing when it was cleaned and when it is due next. (please note that we can not show you everything that we do as this is a very lengthy process that takes between "3 to 4 man" hours for an average size 1200 square foot home of course much larger homes take longer).